Since 2007, Gear For Races a been providing running apparel solutions to the road race marketplace. Whether a marathon, triathlon, a fun 5K race or team apparel we have a cost effective t-shirts and running socks solutions for your event. 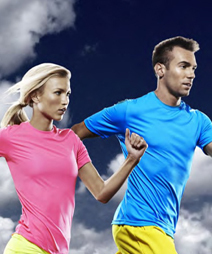 Gear For Races features technical t-shirts, made of 100% polyester and blend fabrics (cotton and polyester), with the latest wicking moisture management, odor and stein resistant capabilities. If you are looking for a cotton t-shirt, we have a soft and very comfortable t-shirt for the runners. Our offerings include many different t-shirts styles and colors for men, women and youth cuts. We can meet your needs for long or short sleeves, tanks or singlets. The t-shirt can be printed or sold blank, if you prefer to print them locally. Looking for a less expensive alternative to promote your event/sponsor. 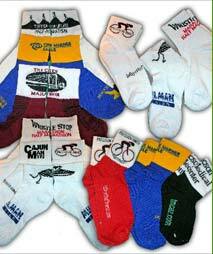 Gear For Races offersr performance and compression socks with logos knitted in the garment. Various styles from footies, small ankle, crew, compression socks/sleeves and arm warmers are available to meet your requirements.